Ph.D. Radiation Health Physics, Oregon State University (2016). 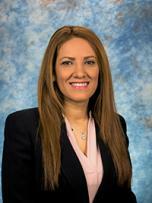 Lily Ranjbar came to Oregon State University with a master's in nuclear physics from Isfahan University of Technology. She earned her doctorate in 2016 and is now part of the teaching faculty. Ranjbar is also collaborating with the Radiation Detection Group on the development of radioxenon detection systems for nuclear explosion monitoring.